Many of the older houses in Ecorse, Wyandotte and the rest of the Downriver area feature huge timbers and intricate wood floors that would cost thousands of modern dollars to duplicate. The wood for these century-plus old houses came from Michigan’s north woods where husky lumberjacks felled virgin white pine trees and floated the logs down streams and rivers to the Detroit River and up Ecorse Creek to the Salliotte& Raupp saw mill. Ecorse historian Al DuHadway wrote a column about the Salliotte&Raupp mill for the Mellus Newspapers in the 1970s. He said that Oliver Raupp, one of Gustave’s sons lived in Wyandotte and showed him four photographs that an obscure, talented photographer who called himself W.J. Watson had taken in the 1880s. Using the cumbersome camera and glass negatives of the time to make pictures of the mill operation, Watson produced clear images of a long forgotten Ecorse industry. 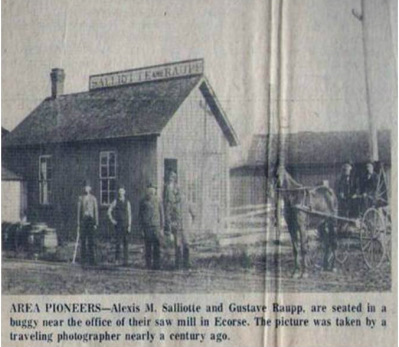 Alexis M. Salliotte and Gustave Raupp joined forces in the 1880s to run the Salliotte& Raupp mill at a profit. The mill was strategically located on the banks of Ecorse Creek. From after the Civil War until about the 1880s, Michigan enjoyed a timber boom, supplying almost all of the lumber used in the United States. After lumberjacks cut down the trees, they were loaded on huge log rafts that were towed down Lake Huron from Alpena and Bay City into the Detroit River and up Ecorse Creek to Salliotte&Raupp’s saw mill. Men worked the saws continuously to fashion the pine logs into finished lumber. This gigantic lumber production resulted in equally gigantic piles of sawdust and wood shavings along the banks of Ecorse Creek. DuHadway talked to veteran employees of the Evans Motor Sales Auto Dealership that occupied a sales room on Jefferson. They recalled that the Dealership had been built over mounds of sawdust from the mill. After the lumber was sawed and smoothed into logs, it was loaded onto boats and shipped to Detroit. In Detroit the lumber was loaded onto railroad freight cars and sent to communities all across the country. 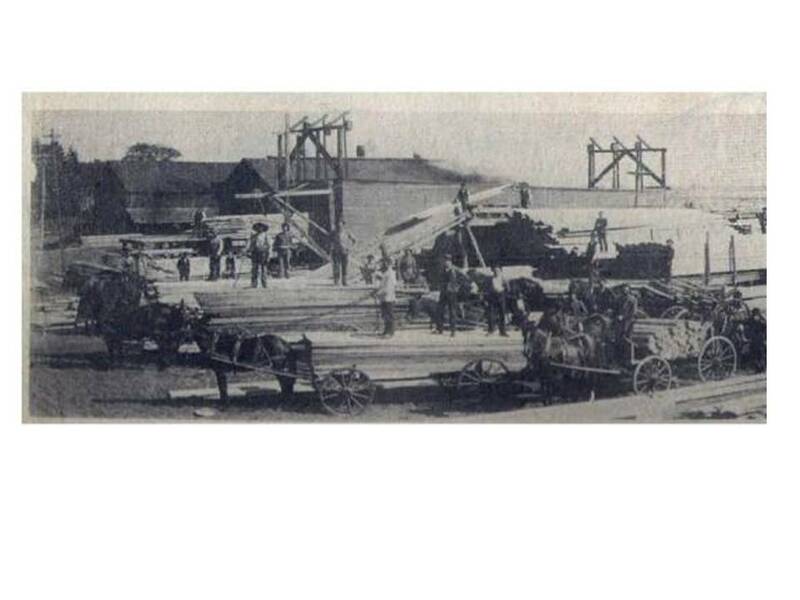 If the timber was consigned to local communities, it was loaded into wagons pulled by teams of horses and oxen and hauled out onto the Mill road into present day Lincoln Park, Southgate, Allen Park and Taylor to be used in constructing homes and businesses. In his column DuHadway said that the old Mill Road came to be called Mill Street because of these lumber days and not because of the Michigan Steel Corporation which wasn’t built on Mill Street until 1924. Gustave Raupp was not a wealthy man when he emigrated to Ecorse from Germany, but he was far-sighted and ambitious enough to establish a sawmill on the banks of Ecorse Creek during the Michigan timber boom. He was also astute enough to enter a partnership with Alexis M. Salliotte. In today’s dollars Alexis Salliotte would be a millionaire and by 1870’s standards he was a wealthy man. He owned extensive timber stands near Ashley, Michigan and took full capitalistic advantage of the lumber boom. When the boom ended in the late 1880s, Salliotte and Raupp dissolved their partnership, but Gustave Raupp continued to operate the mill. After he died in 1923 his sons ran the business for several years. Then in 1929, a spectacular fire that burned out of control for nearly 24 hours destroyed the mill. Besides the houses that their timber built, street names in Ecorse and Lincoln Park are visible survivors of Salliotte and Raupp’s legacy. For many years the home of Alexis Salliotte with its round-towered rooms, cupola, and Victorian gingerbread stood as an Ecorse landmark on the corner of Southfield and High Streets, but it was torn down in the 1970s and replaced with an apartment complex. Two Ecorse streets – Alexis and Salliotte-were named in memory of Alexis Salliotte, who also served as the firs village president of Ecorse when it was incorporated in 1902. There is a Raupp Street in Lincoln Park and Gustave Raupp is also remembered as a founding member of the Ecorse Boat Club. Mill Street which runs through Ecorse, crosses River Drive and continues into Lincoln Park is a reminder of the days when horses pulling heavy wagon loads of wood for houses plodded down its length to new home and business sites.